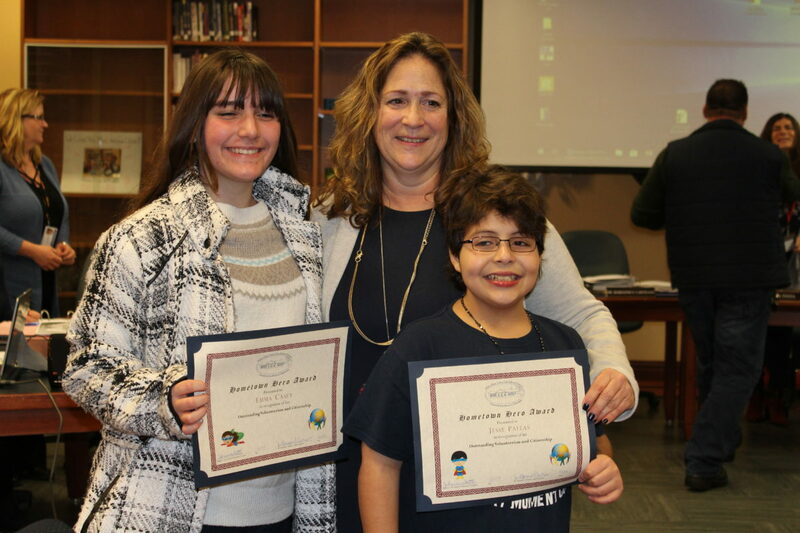 Jesse Pallas, fourth grader at LADSBS, and Emma Casey, eighth grader at Rocky Point Middle School and the daughter of Miller Place staff member, were recently recognized by Miller Place School District’s Superintendent, Dr. Marianne Cartisano, for their ongoing efforts to go above and beyond to help others in the local community. Emma, founder of Emma’s Holiday Hugs—an organization that collects new unwrapped items like books, stuffed animals with tags, puzzles, coloring books, and crayons for children at St. Charles Hospital—was inspired to “do good” in the community during the holiday season. After visiting Jesse in the hospital who was courageously battling Leukemia, Emma was touched by the realization that some children who spend holidays in the hospital don’t always have the opportunity to celebrate with gifts. Emma was determined to make a difference. Founded in 2010, Emma’s Holiday Hugs has since grown exponentially by partnering with local businesses and taking over her parent’s garage with containers filled to the brim with gifts for the local hospital. Her organization that began as a holiday initiative has since become an ongoing effort that continues throughout the year to bring toys to St. Charles Hospital on a need-be basis. Since then, Jesse has also taken the initiative to become a toy ambassador to spread smiles and share toys with others going through a similar experience as he did. In November of this year, Emma presented Dr. Cartisano with a detailed proposal to implement her enterprise across the Rocky Point-Miller Place border and into the Miller Place School District. “After hearing Emma express how we have the ability to turn a difficult situation and childhood illness struggles into something so great, I could not say yes fast enough,” said Dr. Cartisano. The District worked with Emma to place several toy boxes in the District Administration building to collect supplies during the holiday season. Together, MPSD was able to fill 3 boxes of toys for Emma to share with the children’s clinic at St. Charles Hospital. On behalf of MPSD and the Board of Education, Emma and Jesse were each presented with awards of recognition for their outstanding volunteer efforts and citizenship. Both individuals have stepped up to the plate to make their mark in the world by making others happy.